“What is that doing to your completion schedule?” Calvin, just looked at me. No answer. “So, there wasn’t enough time to plan this thing up front?” I said. “There wasn’t enough time to do it right, but there is enough time, now, to do it twice? “Calvin, I know it seems you are really behind the 8-ball, but I want you to stop. Right now. Stop, and get your team around. I want you to draw out each of the steps with your team on a big piece of butcher paper. I want you to plan how you are going to get all the labels on and then plan how you are going to check for accuracy. You should be able to get that plan done in a half an hour. That half hour will end up saving you eight hours on the back end, and you shouldn’t have to do it a third time. 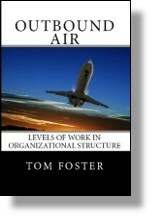 This entry was posted in Accountability, Planning Skills and tagged flow chart, planning, productivity on December 10, 2018 by Tom Foster. “How are you going to fund the startup and who are you going to assign to this new project?” I asked. “Well, that’s a problem. We are currently under a hiring freeze and while we have a budget for development, actually ramping into production is going to pinch,” she grimaced. “Alicia, the biggest mistake that young companies make is that everything looks like an opportunity. Before long, all their resources are spread thin and their product portfolio is a hodgepodge. They can’t figure out if they are in the shoe business or the construction business. This entry was posted in Accountability, Planning Skills and tagged abandon, accountability, planning on March 1, 2017 by Tom Foster. “But the project you are talking about abandoning is a service that we have provided for more than a decade. Our customers have come to expect it. Heck, part of our reputation stands on it,” Byron protested. This entry was posted in Accountability, Planning Skills and tagged abandon, planning, underperformance on February 24, 2017 by Tom Foster.